when we press just right. like fossils the sea has left behind." I am my own worst enemy and most disparaging critic; this, I know. When it comes to my blog, everything grazes against receptive skin and can either make my day or mar an entire late-summer week. Of course, being me, I tend to roost upon the abrasive. I build a thorny nest of crooked twig-shaped (fictitious) slights and peck jagged holes through my own words and photos; especially the photos. With that out of the way, I'm going to try out different lighting, new windows and various backgrounds. Please bear with me if the next several posts include wobbly-legged photos and awkward angles. Eventually I'll get frustrated and fall back into the safety net of past comforts; a northerly window in a too-dark kitchen + an overused wood background board. Trying something new is a foxy way to refresh what's old. Speaking of new v. old, this recipe is a *slightly* different take on last summer's blueberry + rosemary bars. I nudged things in a brighter direction by swapping berries and herbs. Preheat the oven to 375 F. Line a 9x13-inch pan with foil, shiny side up - leave a slight overhang along the edges (this will make the bars easier to remove from the pan). Butter the foil. Prepare the crust & crumb topping: In a large mixing bowl, combine the sugar, lemon zest, and thyme. Use your fingers to rub the zest and thyme into the sugar until it becomes moist and aromatic. Whisk in the flour, baking powder, and salt. Add cold cubes of butter and beaten egg; use a pastry cutter to work the butter and egg into the dry ingredients. The mixture will be very crumbly but should hold together when pinched. Press about half the mixture into the bottom of prepared pan. Spread jam over the crust - leaving about a 1/2-inch bare border around the edges. In a separate large bowl, combine the strawberries, sugar, lemon juice, and cornstarch. Gently stir everything together. Distribute the berry mixture evenly over the jam and crust (it's okay if the berries touch the edges of the pan). Sprinkle the remaining dough mixture over the berries. Bake for 45 - 55 minutes or until the crumb topping turns very light brown - the berries should be bubbling slightly too. Remove the pan from the oven and place it onto a cooling rack. Cool completely (about 5 hours) before slicing. Once the pan has reached room temperature you can place it in the refrigerator to cool off faster. Use the foil overhang to lift the bars out of the pan. I've always loved your photos, and for some reason, it always seems like my favorite posts and photos, the ones I think are going to take the world by storm, just quietly fade into the background. It's so utterly unpredictable...Anyway I love these bars, the combination of fruit and herbs is so elegant! Don't be so hard on yourself! I think sometimes when things are frustrating (as difficult as it is), it forces us to take a different perspective and grow. Sometimes photography practice is easiest when it's not for a post and I'm just shooting peaches to play with different lighting, etc. It takes the pressure off :). 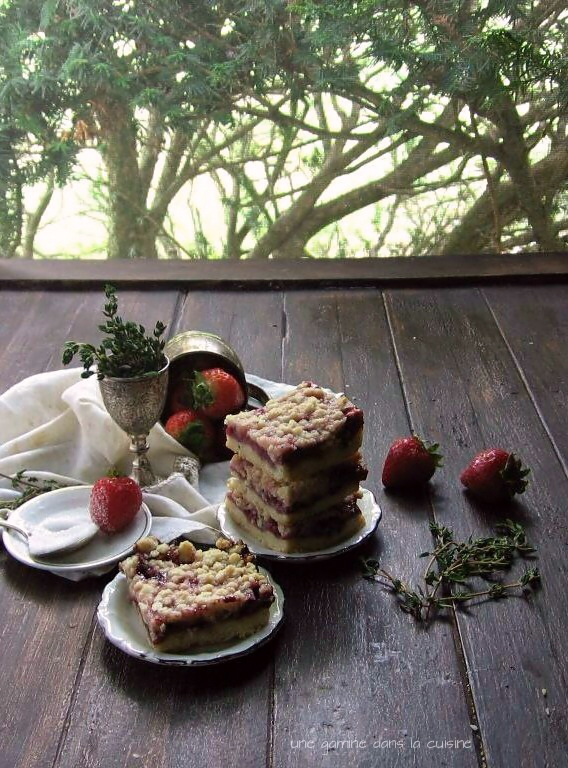 These bars look heavenly, love the strawberry-thyme pairing! (Crumb bars cure most things, I'm convinced ;)). The crumb bars are everything I love. And I love the poem excerpt - I must check out his other work. I never would've known you use a P&S had you not said so. Your pictures evoke such emotion, something elusive, but rippling underneath the calm. They are indeed gorgeous, as I'm sure are these bars. I love your photography Valerie - it's refreshing and reminds me I'm visiting your blog. I really love the poem excerpt choice too! Your photos are beautiful! Don't do this to yourself, please. Perfectionism is cage we build around ourselves and then it's very hard to escape from it. Your photos are always so thoughtfully and well styled, Valerie. You also convey the story and emotion very well which is why I'm immediately drawn to your work. Honestly, don't beat yourself up so much, as a blogger, I feel your pain. It's not worth trying to figure out what will go viral on the different social media platforms, just go with what makes you happy. aww, Thank you Anna! :D I would love to share a plateful of bars with you (with some Irish coffee! )...we could dish about dishes and wrinkly linens!! I can relate all too well! Honestly, whenever I think a recipe is going to be a huge hit, I'm wrong... and sometimes when I think one is pretty weak it is huge... food blogging is very unpredictable! 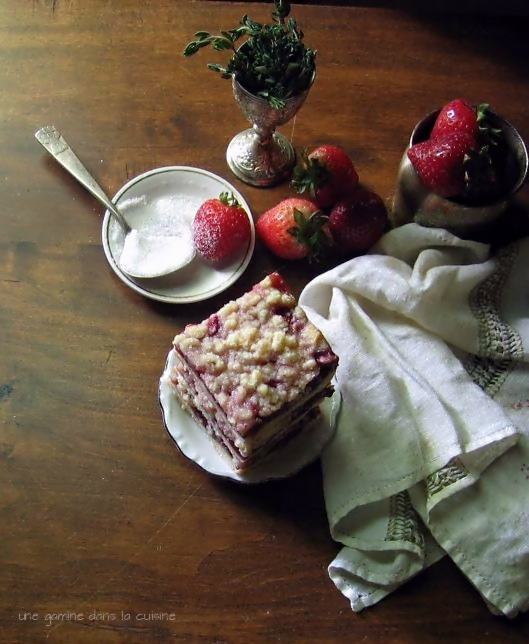 Love these bars and the combination of strawberry and thyme sounds like summer perfection. 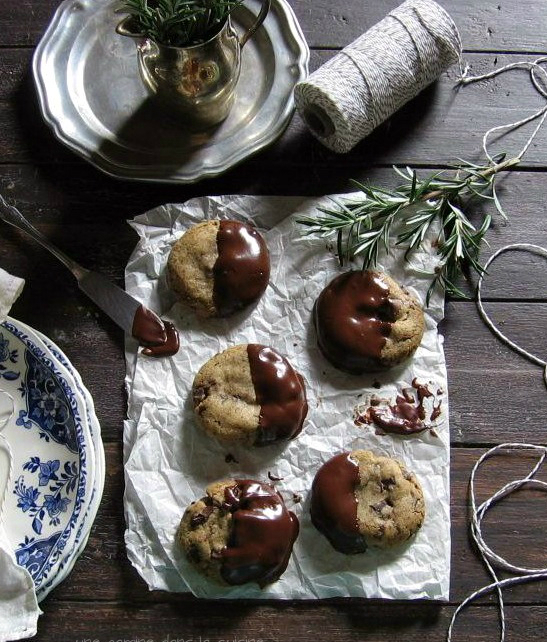 What a gorgeous recipe and gorgeous pictures too. We are always our own worst critic. I can so relate to your feelings and I thank you for sharing them so honestly! I absolutely love your photography. It has character. It tells a story. I learned that it's best to find your own style and perfect it. Don't worry about what everyone else is doing or what is/isn't making it on Pinterest. Do what works for you, and the rest will come (in time). That being said, I love these bars. 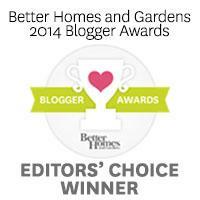 I just stumbled across you're site and I think it is lovely!!! I know exactly what you mean when you describe the disappointment that a picture's lack of popularity brings. Sometimes you think you have a real winner, but for some reason, nobody else does. People are fickle and totally unpredictable when it comes to what they'll pin and share. There is such a fine balance between learning from others styles and beating yourself up about your own (I am so guilty of the latter). Keep up what you are doing, it is awesome and my first thought when I saw your photo on IG was "I want my photos to look like that" - no kidding.